It is an inescapable fact that causation, both generally (in populations), and specifically (in individuals), cannot be observed. Rather, causation is determined when it can be inferred that the risk of an observed injury or disease from a plausible cause is greater than the risk from other plausible causes. While many causal evaluations performed in forensic medicine are simplified by the fact that the circumstances surrounding the onset of an injury or disease clearly rules out competing causes (eg, a death following a fall), there are many cases that present a more complicated picture. It is these types of investigations, in which an analysis of comparative levels of risk from competing causes is needed to arrive at a reliable and accurate determination of the most likely cause, that forensic epidemiology (FE) is directed at. In Forensic Epidemiology, the authors present the legal and scientific theories underlying the methods by which risk is used in the investigation of individual causation. 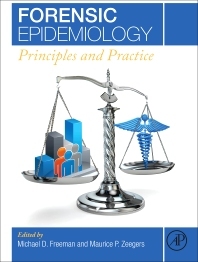 Methods and principles from epidemiology are combined with those from a multitude of other disciplines, including general medicine, pharmacology, forensic pathology, biostatistics, and biomechanics, inter alia, as a basis for investigating the plausibility of injury and disease exposures and mechanisms. The ultimate determination of the probability of causation (PC) results from an assessment of the strength of association of the investigated relationship in the individual, based on a comparison between the risk of disease or injury from the investigated exposure versus the risk of the same disease or injury occurring at the same point in time in the individual, but absent the exposure. The principles and methods described in Forensic Epidemiology will be of interest to those who work and study in the fields of forensic medicine, epidemiology, and the law. How Epidemiological Evidence Relates to Legal Standards of Proof? Is the Expert Always an Expert? Michael Freeman is a forensic epidemiologist and consultant in forensic medicine, working in civil, criminal, and academic venues. He has provided expert testimony more than 1,000 times in a wide variety of civil cases, including injury and death litigation, product liability, toxic tort litigation, tobacco litigation, medical negligence, as well as in homicide and other criminal matters. Dr. Freeman has more than 170 published scientific papers, books, and book chapters, primarily focusing on issues relating to forensic applications of epidemiology and general and specific causation. He has published research on the topics of traffic crash-related injury and death, injury biomechanics and injury causation, genocide, cancer epidemiology, chronic pain mechanisms, and adult autologous stem cell therapy, inter alia. Dr. Freeman holds academic appointments at the CAPHRI School for Public Health and Primary Care at Maastricht University Medical Center, Oregon Health & Science University School of Medicine, and Aarhus University, Department of Forensic Medicine. He serves as an Affiliate Medical Examiner with the Allegheny County Medical Examiner's office in Pittsburg, PA.
Dr. Freeman holds a doctor of medicine degree (Med.Dr., Umeå University), a doctorate in in public health with a major focus in epidemiology (Ph.D., Oregon State University), and an MPH degree (Oregon State University), inter alia. Dr. Maurice Zeegers has dedicated his career to researching bladder cancer, during which he has directed numerous research studies and randomized clinical trials to investigate the relationship between nutrition and urinary bladder carcinogenesis. He has published over 250 peer-reviewed scientific papers in the highest-ranked academic journals and is regularly invited to speak on the topic at international scientific conferences. Dr. Zeegers currently holds a Chair in Complex Genetics and Epidemiology as full professor at Maastricht University in the Netherlands, where he also serves as its Head of School and as Director of CAPHRI, the Care and Public Health Research Institute. He acts as the vice-president of the European Epidemiology Federation and holds honorary professorships in England, Belgium and China.